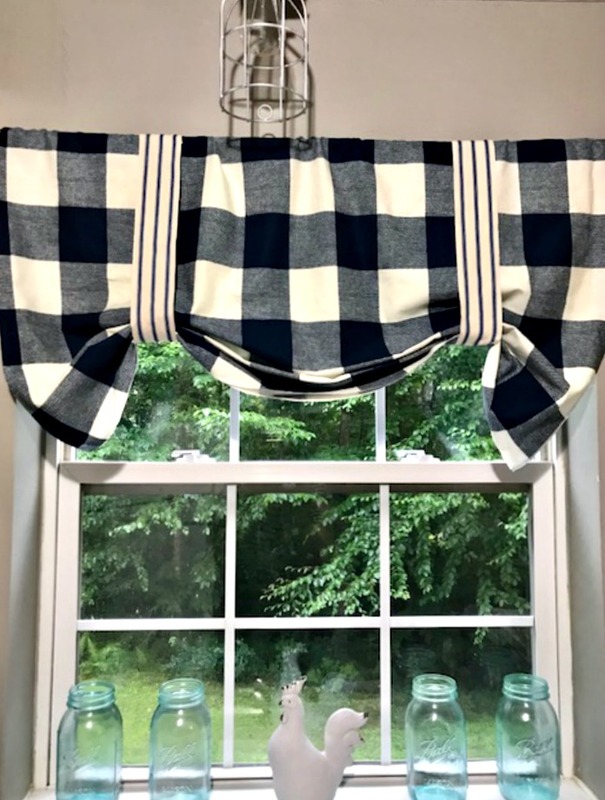 If you are looking for on trend buffalo check curtains without the high price of the Department Store, check out this easy no sew buffalo check version. Have you been into Hobby Lobby or Homegoods lately? The fall stuff is out already and I was thrilled to see buffalo check everywhere. I’m talking pumpkins, table runners and tablecloths just to name a few. I fell in love with buffalo check in home decor last year when I participated in a Fall Home Tour with some of my favorite bloggers. I am very careful about decorating on a budget, so I made a mental note to incorporate buffalo check the next time I needed new curtains. Well, that time is now-yay! My daughter and I just moved to a new Townhouse which means I have new rooms to decorate! Now, remember I mentioned a budget? New curtains can be pricey, but making your own is an easy and inexpensive way to update your home decor. The first thing I did was go to Hobby Lobby and buy navy and white buffalo check fabric. It is a duck cloth fabric and was $9.99 a yard, but I used a 40% off coupon. I bought 4 yards for $24. Not only was I able to make curtains for my kitchen and dining area, but I have plenty leftover to make those adorable buffalo check pumpkins I mentioned, plus a couple of other things. So… are you ready to see how to make these buffalo check curtains? Move on to the next page to get started. I cannot be saying goodbye to summer just yet but I do love a bit of buffalo check all year round! These look great. These curtains look great, nice that they are no sew too! Thank you for visiting Laura! Love this project, Michelle… Pinned to my DIY Dreams board! Hugs, friend! Cute idea love the results. Those are beautiful! I love this simple idea, thanks! Yesterday, I had wrote in my home journal to change the current window treatment over my sink in the kitchen – this will be perfect . . . Thanks! I am so happy to hear that I inspired you! It is a perfect curtain for over the sink and you can use any fabric you like! Have a good day!